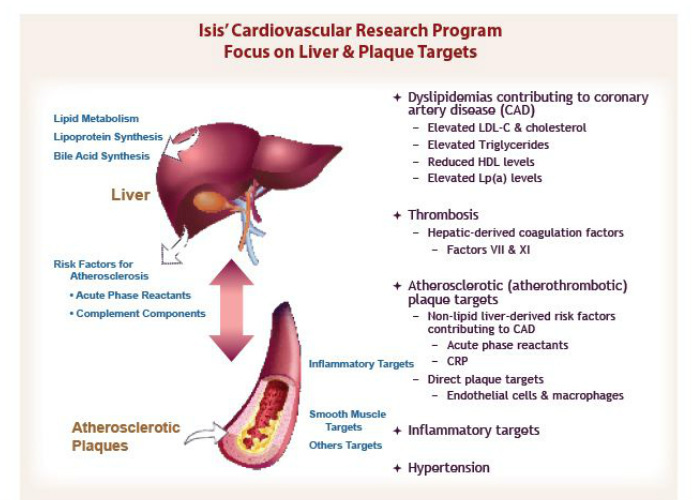 focus on targets in liver now, acutal plaques next (6/2011 Annual Meeting described "novel target to affect cells at vascular plaque sites"). Plan to add Lp(a) and Factor VII candidate to pipeline in 2011. Only Lp(a) is mentioned in 2010 10k. Antisense against CRP, which is produced in the liver. Elevated CRP is associated with numerous inflammatory diseases (including Crohn's and rheumatoid arthritis), coronary artery disease, CV disease progression, end-stage renal disease, and multiple myeloma. Previously known as ISIS-353512. But 8/2011 RA phase 2 trial listing refers to ISIS-329993. Detailed info on the CRP program featured on this poster from 6/2011 Annual Meeting. Phase 2 plan- evaluate in diseases with elevated CRP that will provide rapid clinical proof of concept. Multiple myeloma and RA are the first indications planned. Phase 2 trial in Rheumatoid Arthritis (NCT01414101). Initiated 8/2011. Randomized, double-blind, placebo-controlled trial of 48 patients. Primary endpoint is safety at 99 days, secondary endpoint is serum CRP levels at 57 days: note there are no RA efficacy endpoints. 9/2010: broad p2 pgm in late 2010 would be in multiple myeloma, rheumatoid arthritis, late stage renal disease, organ transplants or atrial fibrillation. CRP is assoc w/ poor outcome in numerous diseases. Some indications would have simple p3 plans, others (CV) would need outcome studies. Majority of CRP made in liver, but can get drug into bone marrow for MM. 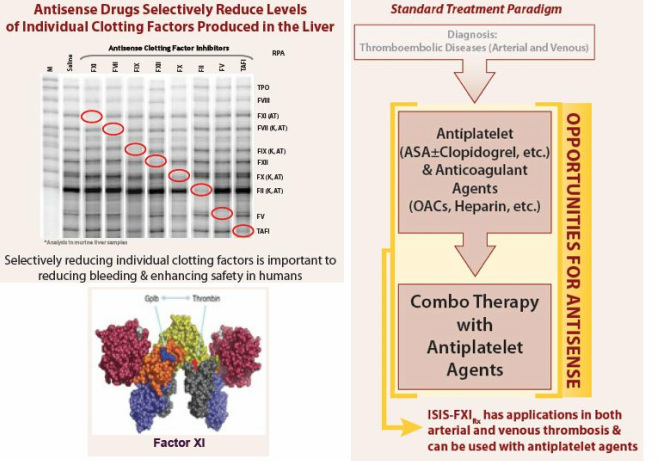 Antisense targeting Factor XI for clotting disorders. FXI is produced in the liver and plays a role in the coagulation cascade. Reducing FXI may help prevent blood clots with low risk of bleeding. 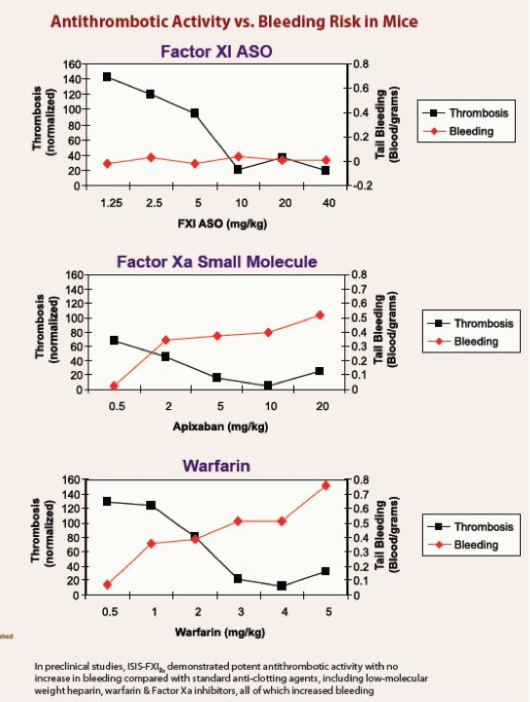 Humans deficient for FXI have a lower incidence of thromboembolic events. Plan staged development for various thromboses (market opportunities in both arterial and venous thromboses). The FXI program was featured on this poster at the 6/2011 Annual Meeting. 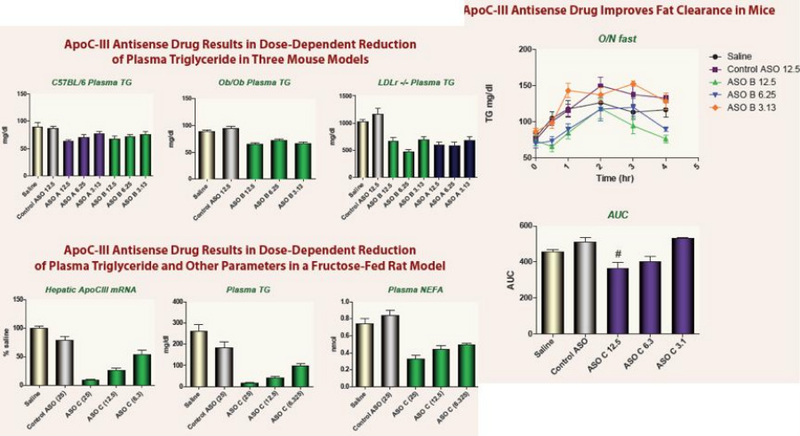 Antisense targeting apolipoprotein C-III (apoC-III), a glycoprotein which is produced mainly in the liver and inhibits clearance of triglycerides from serum. 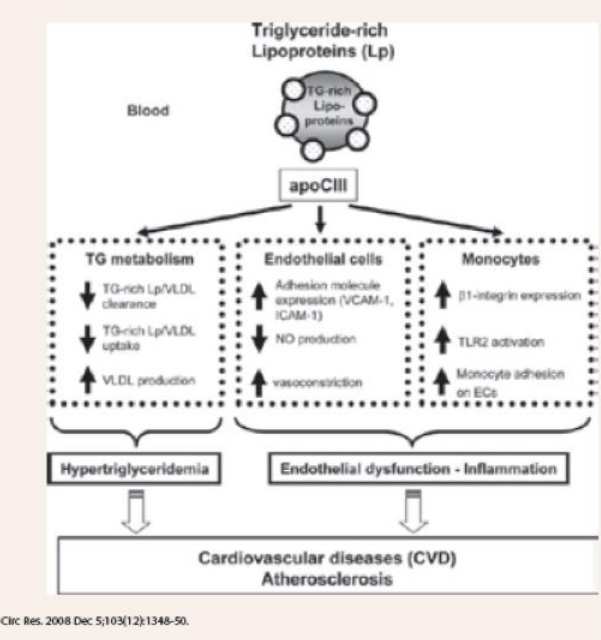 Reduction in apoC-III leads to decreased triglycerides. High triglycerides are an independent CV risk factor, a risk factor for stroke, and a hallmark of metabolic syndrome (common in type 2 diabetes). Genetic validation: "Humans with genetic loss of apoC-III have low triglyceride levels & low cardiovascular risk"
The ApoC-III program was featured on this poster at the 6/2011 Annual Meeting. 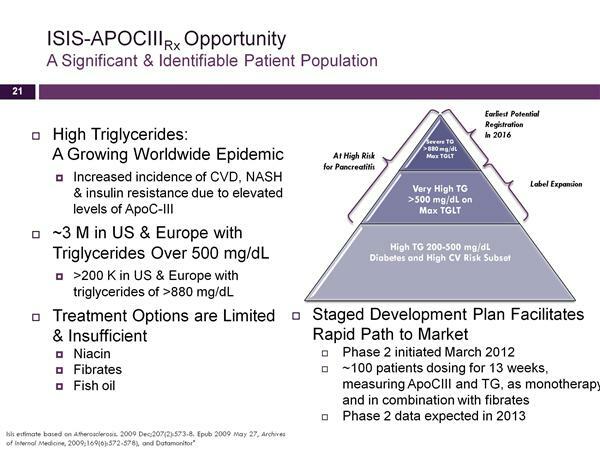 9/2010: after p1 plan to move rapidly into p2 w/ pts w/ elevated APOCIII and triglycerides for efficacy. Possible initial indication for pancreatitis caused by high triglycerides (>500)...then elevated, then diabetes [staged devel like mipo].